The Selfless Hero Award was established to help encourage people of all orientations to step out of their comfort zones and engage in selfless acts that uplift and put a smile on the face of others. 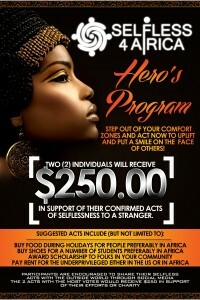 Selfless4Africa awards $250.00 to two (2) individuals who have demonstrated acts of selflessness to a perfect stranger. Participants are encouraged to share their selfless act with the outside world through social media. Selfless act must be performed outside their normal sphere of comfort. Beneficiaries of selfless act must be a perfect stranger (Beneficiaries who are family, friends, acquaintances, colleagues will disqualify the submission). Participant must provide details for the verification of their selfless act; monetary award is granted after a verification process. Winning participants will be selected by S4A Team. The (2) selfless acts with the most votes will receive $250 in support of their efforts or to a charity of their choice. The two Hero Award recipients will be recognized and availed an opportunity to speak at the Benefit Gala. 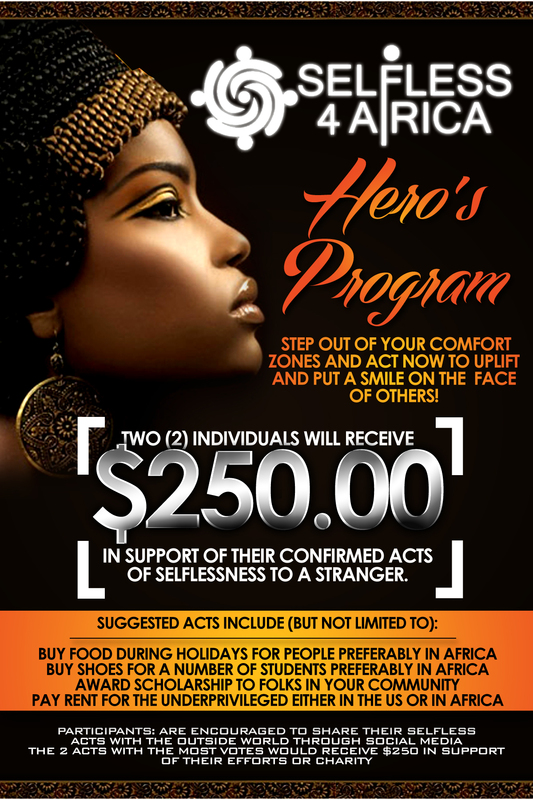 The S4A Team is encouraged to participate in this program but are not eligible for to receive the Hero award. 2013 Hero’s Award Application Form – Completed applications must be submitted to programs@selfless4africa.org by December 27, 2013.